Why do you need a reliable Usenet Search Engine? That is almost like asking why do I need Google (or sometimes Bing)? If your NZB search results in crappy results what you might get in the end may nor work or may work but be of bad quality. Most people are perfectly happy with one of the many free Usenet indexers that come default with Sick Beard or CouchPotato. But free NZB sites are not good at weeding out spams, viruses, and bad quality items. They also do not care about password protected files or those that do not extract or complete successfully and slow to update. So not only have to wasted the time but also your Usenet bandwidth. So if you are going to skimp and settle with a free Usenet search engine, then at least have an Unlimited Usenet account. The rule of thumb is to have 1 or 2 of the above best Usenet Search Providers, preferably the paid ones, as your primary NZB index along with the free Usenet indexing sites as backups. DogNZB has quickly risen in popularity recently. The homepage redirects to Wikipedia but once setup, it just works. The indexes are well-organized with little to no spams, viruses and bad releases. Registration: Closed. DogNZB, like most paid NZB indexing sites are notorious for opening up registration for brief periods of times or through invites. You will have to watch closely and get in when it is open for registration. OMGWTFNZBs is also one of the best Usenet Search Providers (except the name) currently in service. Once again, highly organized with almost no bad downloads. Registration: Open but paid VIP accounts only. Sometimes through invites. NZB.su has been in the business for a long time. It is also a great NZB indexing site with quality items, but unlike some others that have one-time payment, has monthly recurring payments. Registration: Closed. Registration opens for brief periods of times randomly or through invites. Cost: Paid. Free accounts get 20 downloads per day directly through the website but no access through apps like Sick Beard, CouchPotato, or NzbDrone. NZBGeek, relatively new player and supports Sick Beard. Very similar the other best Usenet Search providers listed above. Registration: Open (free and paid). Cost: Free account gets 2 NZB downlods per day. Paid account gets unlimited downloads and guest invitations. 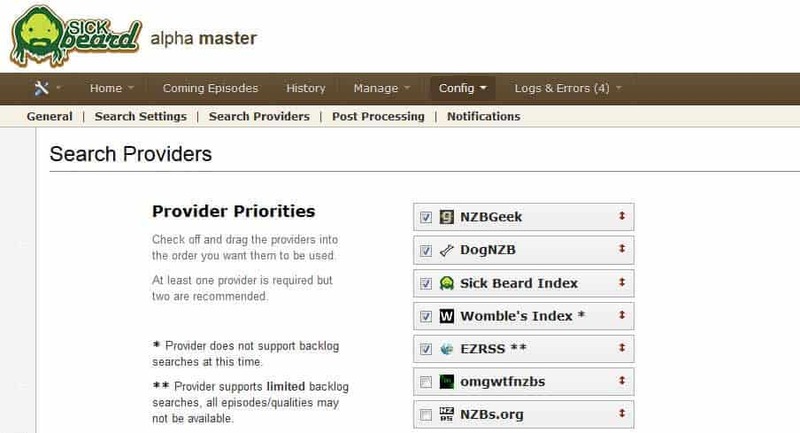 nMatrix, a free NZB search engine, like the above paid NZB indexing sites provides API access that is needed for apps such as Sick Beard and CouchPotato. Cost: Free – 100 API hits (needed for SickBeard and CouchPotato) and 50 download requests per day. Update (9/3/2015): nMatrix is non-functional at this point. You may try binsearch.info. Having a reliable Usenet account and NZB search provider will almost always ensure 100% completion of all the downloads. But Usenet indexing sites are frequently taken down due to copyright / piracy. So you may pay for 1-year but the site may be gone tomorrow (remember NZBMatrix?). Hence why having multiple indexes is recommended. Moreover, PayPal is denying service to Usenet indexes and so Bitcoin becomes the only mode of payment. If you can jump through these minor hoops and one or two of the best Usenet Search providers then you can get one more step closer to having a fully automated media center / download station. How to properly uninstall Sickbeard on Ubuntu Linux? How to properly uninstall CouchPotato on Ubuntu Linux?